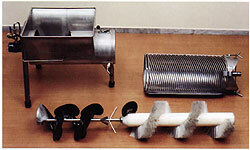 The declumper has a large, hopper-type opening into which the mussels are dropped, and cylindrical section housing rubber blades to do the declumping. The bottom of the last section(s) has adjustable openings for grading the mussels. Extra rubber blades or brushes can be added for more declumping and washing. The machine is made of stainless steel, is driven by a hydraulic motor OMP 200, weighs approximately 50kg, and can process up to 4000kg/hour. To declump/grade and wash mussels. The unit can be mounted on a boat in conjuction with other machinery (access ramp M-501, mussel stripper hauler M-500, spanish continuous socking machine M-514, 515) to process continuous longlines. The rubber blades separate the mussels from one another, and they are sorted by the grader, (and pass accordingly into the spansih continuous socking machine, to be fastened once more onto the longline as it passes over the bow.) The declumper/grader can be used on its own as well, in cultures such as non-continuous longline and mussel rafts. The machine is fairly low-tech, easy to install and use, and virtually maintenance free. Small and light-weight. It has a number of adaptations available, including the addition of extra rubber blades for declumping of mussels with strong byssal threads, and a brush which has high pressure water flowing through its bristles, to gently wash the mussels. The grader bars are adjustable custom grades.